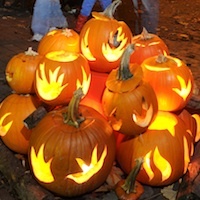 Over 400 uniquely carved jack-o-lanterns and luminaria light your way along two trails as you venture through the darkness. This very popular family-friendly evening includes face painting, fortune telling and special treats. This event sells out well in advance every year. Parking passes, required to attend, go on sale at the annual Golden Harvest Festival, September 7 & 8, for event visitors, with in person & phone sales opening Monday, September 9. Passes can be mailed for an additional $1 per order. Please note: Drop offs are not allowed, nor is parking along East Mud Lake Road, a parking pass is required for entry into the parking lot. For those who purchased the advance sale parking passes, entry to the event is $3 per person (3 and under free) and is paid at the gate. If you have not already purchased a parking pass, you will not be admitted to the event.